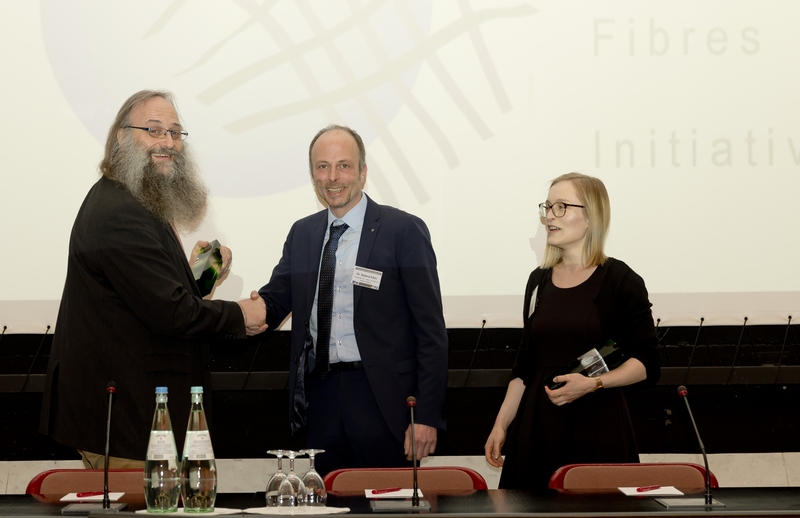 Marie-Isabel Popzyk, Scientific Assistant at Aachen University and Dr. Roland Klein, Group Manager at the Fraunhofer-Institute in Germany were selected through a process of on-line voting by participants in more than 100 countries to win the 1st Discover Natural Fibres Initiative (DNFI) Innovation in Natural Fibres Award. Their submission, “Reduction of the moisture absorption of natural fibers and production of no-twist yarns for use in structural components”, showed that up to 100% bio-based, natural fibre reinforced plastics (NFRP) with low moisture absorption can be developed and brought to application in structural components. The researchers noted that natural fibres, such as bast fibres, are becoming increasingly important in technical applications such as composites. Natural fibres are environmentally friendly and characterized by low density and high mechanical properties. Compared to the production of glass fibre reinforced plastics (GRP), approximately 30% less CO2 is emitted by NFRP and energy consumption is reduced by approximately 40%. Dr. Terry Townsend, Chair of DNFI, noted that the research by Popzyk and Klein characterizes the dynamic nature of natural fibre technology. From performance apparel fabrics to innovative biocomposites, natural fibres represent solutions to 21st Century challenges. 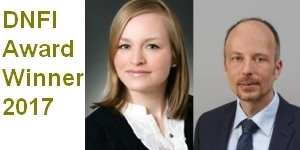 The voting process for the DNFI Innovation Award began in July 2017 when a subcommittee of DNFI members winnowed the list of many excellent nominations to five finalists. Worldwide voting was conducted during August and September. The 2017 DNFI Award Trophy was handed over by the DNFI vice chair Michael Carus (photo left) on 6th December 2017, during the BCC Conference in Cologne/Germany.